Year Round Outdoor lovers Paradise, enjoy skiing, biking, hiking and golfing. 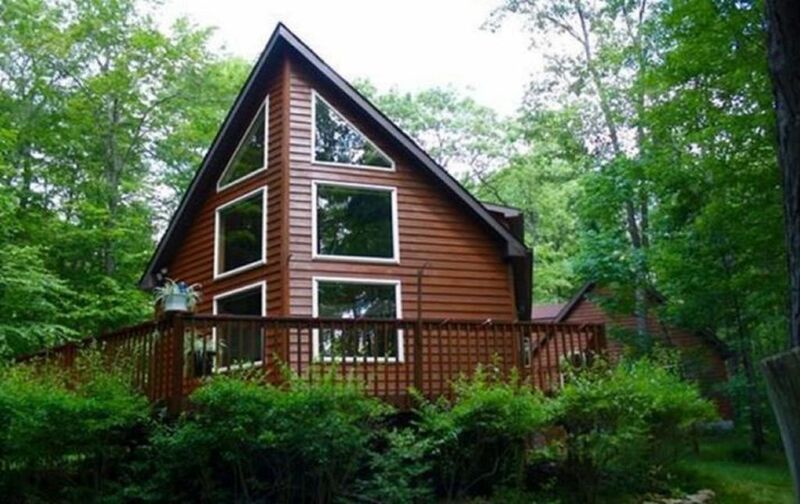 2100 Sq Ft A- frame located at Blue Knob ski area. House sits on Golf course hole #8. 5 minute drive to the lifts at the top of the mountain. Newly furnished with 1 king, 3 queens and 2 sets of full on bottom twin on top bunk beds. PLEASE NOTE you will need to bring your own bed sheets and pillow cases. The main sitting area also has a gas fireplace and floor to ceiling windows overlooking the golf course. The finished basement has a flat screen TV with Xbox. Please bring your own Xbox games. Kitchen is fully equipped with multiple appliances , and cookware to cook large meals. We also have a K-Cup coffee maker. Blue Knob Ski Area offer the highest elevation ski area in PA as well as the highest vertical and longest runs in PA. The ski resort was just purchased by new owners this past summer and huge improvements are planned for their snow making systems as well as lodge. The golf course also provides a wonderful place for morning or evening walks in spring, summer and fall and cross country skiing in the winter. There is mountain biking and hiking that surrounds the golf course plus miles and miles of mountain biking and hiking in Blue Knob State Park 10 minutes away. (see attached screen shot from MTB project) Its also worth mentioning The Allegrippis Trail system which many consider to be the best MTB biking on the East Coast is 45 minutes away at Raystown Lake. Raystown Lake is also well known for its fishing. My girlfriend and I just purchased this home together as a great weekend getaway and an investment. We had such great luck renting a beach house in DE that we wanted to do the same but up in the Mountains. Blue Knob has it all. Skiing, Mt. biking, hiking and ATVing. No other place I know of has all that. The house was in great shape and did not need any work. The use of the 2 car garage during ski season is a real nice perk, especially when it is snowing. Fell free to use the 2 car garage to store your car and ski gear. This is a real perk especially during the winter months, that I doubt you will find with other rentals in the area. Yes, BUT, the speeds are NOT adequate to stream video, i.e. Netflix/UTUBE. There are DVD players up and downstairs and I have numerous videos, but you might want to bring your own as well. full kitchen with plenty of kitchen supplies to cook large meals. 4 bar stools for the countertop seating area in addition to the dining table that seats 6. There is Alison a leaf located in the hall closet if you wish to get 8 around the dining table. There is a ramp that has access to the main living level. Located at the resort. It is not on the property of the house itself. We were a group of 3 families that went there to enjoy a ski weekend and the house was perfect for us. It is very well maintained and equipped, like the gloves/boots warmer that we used a lot, after a long ski day or the ping pong table that the kids enjoyed a lot. Also it is only 5 minutes from the ski resort!!. Thank you very much Mr. Carter for letting us have an excellent experience at your house. We are planning to return next year! A few of my friends and I stayed here during the last week in January 2019 and we all had such a great time! The house is very well kept and has all the amenities you'll need. It is a very short drive, less than 5 minutes, to Blue Knob. The front door has a code activated lock on it, which was very nice so that everyone could come and go as they please without needing to worry about a key (we've had issues with only having two keys in the past at other houses I've rented). The gas fireplace was very nice on those cold mountain nights. This house definitely exceeded my expectations! We all loved this house and will definitely be staying here next time we plan a ski trip to Blue Knob Ski Resort. Oh and the owner, John, made sure we had everything we needed and would text me every once and awhile to make sure we were all set and weren't having any problems or issues. Best owner I've rented from thus far using HomeAway! Thank you, John! This home is pristine. It is highly organized and fully equipped for all your needs. The location is private and quiet. The furnishings are new as well. And John could not have been easier to work with- an ideal owner. We are already contemplating a return visit or two for next year. Thanks again for leaving the place immaculate!! House was just as I wanted. Clean, plenty of room for everyone to spread out. I had a group of guys for a guy weekend. Played ping pong, yard games and golf. TV’s were great and we just had a great time. Kitchen was great, had everything I needed to cook some great breakfasts. There was a lot of condiments and some things in frig when we got there. No big deal I guess if you forgot to bring some you could have used them. Other than that no negative comments. John the owner was very quick to respond to any concerns you may have. The VRBO home was in a beautiful location and my Michigan cousins loved it! The only issue I would like to mention is the size of the refrigerator and the fact that there was quite a bit of food in the fridge and freezer when we arrived. We had a hard time finding space for the food that my sisters and I brought for the entire stay. A larger fridge and an automatic ice maker would be great! Other than that, everything was wonderful. We enjoyed the fire ring a couple of times. We hiked on a trail in the State Park and reminisced about our childhood days. We even had a larger picnic at the resort pavilion. I would definitely rent this home again! We love love Blue Knob!! !